Happy Easter Everyone! I hope the Easter bunny was good to you! 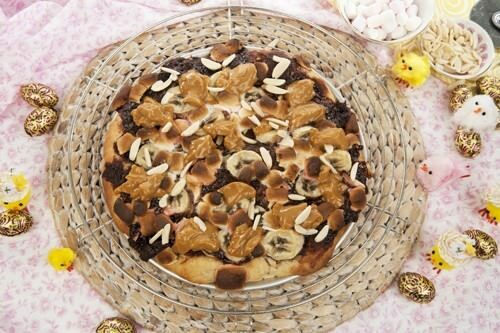 Now I know we can never have too much chocolate so I decided to share my Nutella Easter pizza with you today. 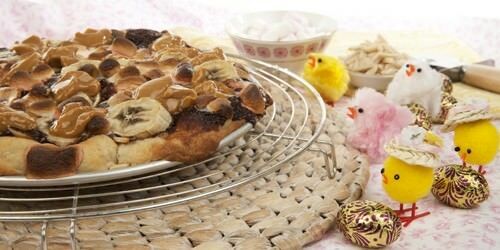 If you are planning on making a dessert for Easter this would be a great choice. I will warn you though, it’s amazing, and addictive, and although you should choose to eat just a small slice, it is very easy to devour way more. The recipe makes 4 medium or 2 large pizzas and is delicious served straight out of the oven with vanilla ice-cream. If the chocolate is too much, why not try a delicious dessert Calzone loaded with berries. Place the dough ingredients into your breadmaker and put the machine on to the dough only cycle. Oil four pizza plates liberally. When the breadmaker has finished divide the dough into four equal balls and roll out to fit the pizza trays. Allow the dough to stand in a warm place to proof. Once the pizza dough has risen about 1-2cm add the Nutella. 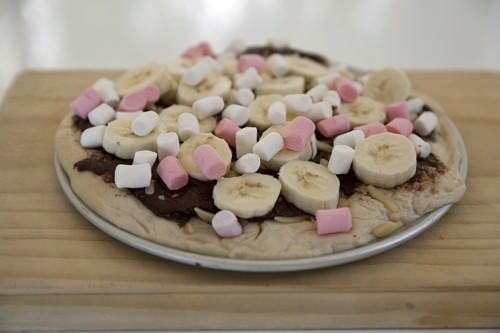 Scoop teaspoons of Nutella over the base until most of the pizza has been covered. Smooth the chocolate out slightly. Add the banana, marshmallows and nuts to the base. Cook the pizza for 10-15mins or until the base is golden. 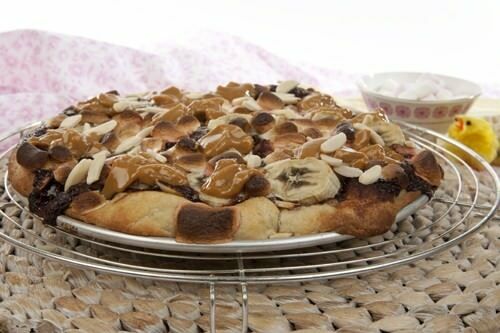 Remove the pizza from the oven and add teaspoons of Dulce de Leche to the pizza while it is still hot. Serve immediately but watch out! The marshmallows are like molten lava! I have kept this story short and sweet. I do hope I won’t be responsible for causing a sugar induced coma in any of my readers. Have a lovely Easter break and drive carefully if you are travelling.